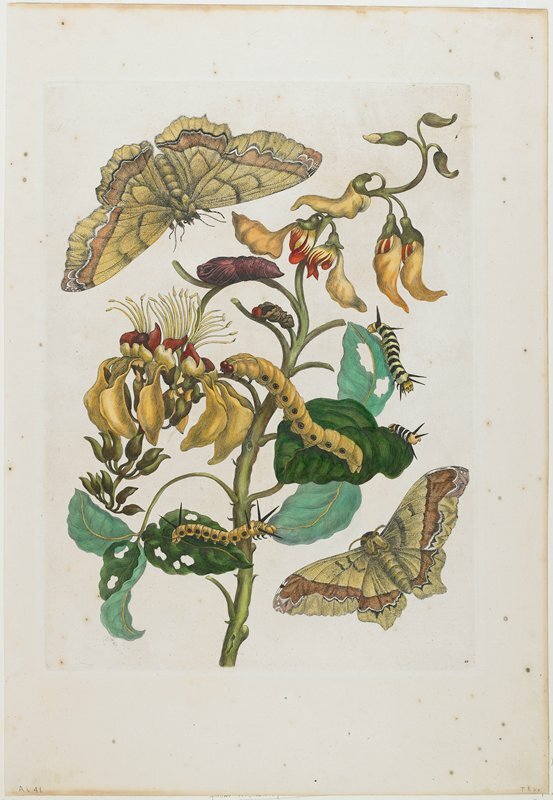 In this beautifully balanced composition, Merian has depicted two Saturniid moths Arsenura armada (Cramer) at top right and bottom left. The larvae are not the early stage of this moth as Merian had thought, but of another species. The plant in the center is the Palisade tree, which can grow sixty-five feet tall and is native to tropical South America. The Saturniid moth has a wide distribution from Mexico to southern Brazil and can vary greatly in appearance. Dwight and Helen Minnich, Minneapolis; sold to MIA, 1966.